your skin is UNIQUE ...... shouldn't your skincare be? "PowerPeel" is one of the leading medical microdermabrasion treatments on the market. We are offering an in-depth Power Peel 3 pass Crystal Free Microdermabrasion treatment for superior exfoliation and clinical results. •up to $300 value & pricing valid ONLY with mention of this event in email. **Also - Includes Detoxifying Hand and Foot Aromatherapy Wrap! HydraFacial is a multi-step facial treatment similar to a microdermabrasion but so much more! 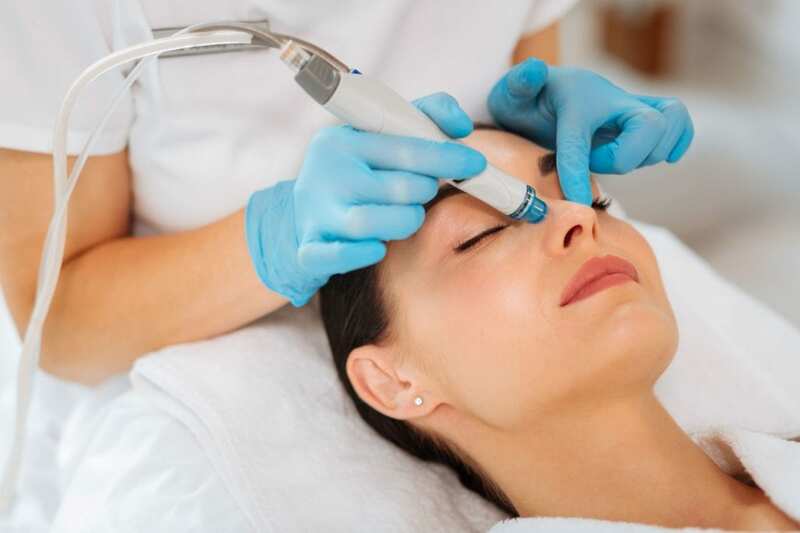 HydraFacial steps include microdermabrasion, exfoliation, vortex extraction, and rejuvenation while infusing the skin with hydrating, and nourishing serums. It's the new "it" treatment used by celebrities to get red carpet ready. HydraFacial has recently been featured on The Doctors, Extra, The Rachel Ray Show. HydraFacial is great for all skin types and can be customized to suit your skin concern - sensitive, acne-prone, anti-aging. on these days to receive special pricing. Sunday & Monday unless otherwise specified. All treatments performed by students supervised by licensed instructors. At the school MEDSPA, we educate our clients on the science and biology of what is necessary to make the changes they want with their skin. This empowers them with the knowledge to know the difference between what works product and treatment wise and what does not work. School founder, Laura Todd, is a master esthetician and instructor with over 20 years experience. Laura Todd holds university degrees in Science & Biology, her focus was pre-med, course work at the masters level in education, holds prestigious certifications as a certified laser technician, and is a leading textbook author for the esthetics industry. Laura Todd & her team personally train skincare students to aspire to achieve the industry's highest standards to provide you the best treatment outcomes possible. Not only does our Medical Director, Dr. James Cook focus on Health & Wellness in his own practice, he is a valuable asset to our skin health and wellness curriculum review team. The Institute of Advanced Medical Esthetics provides a community service to the public by making the school MEDSPA a viable option for skin health and wellness treatments at affordable pricing. We only offer results based treatments what focus on changes that make a difference in your skin. into action....... by our skin experts! Let us "get under your skin"........... and coax yours too! LED Light Therapy For You? Skin Rejuvenation is a safe, non-invasive procedure that allows you to rediscover the fresh, healthy skin of your youth. Improve lines, texture & tone and plump up your skin by stimulating collagen production. Restore a youthful, clear, dewy completion that signifies skin heath and wellness. Treatments are given in a series of 6-12 and then maintained once every 4 weeks. The cellular response & collagen building results will be noticeable 6 months from your last treatment. It is important to remember monthly maintenance treatments are required to maintain your results as collagen continues to decrease with the aging process. FULL - Approximately 45 minutes treatment time (up to 1.15 hour with paperwork, check in & out). Express - Approximately 20 minutes treatment time (up to 1 hour with paperwork, check in & out). Rebooking: recommended every other week or once a month, as your schedule and budget allows. Benefits & results: improve the tone, texture and clarity of your skin; reduce or eliminate age spots, freckles, and hyperpigmentation; soften lines and wrinkles; and clear acne conditions. The Vi Peel, designed to reverse the signs of aging and sun damage. Its synergistic blend of gentle yet powerful ingredients can improve the tone, texture and clarity of your skin; reduce or eliminate age spots, freckles, and hyperpigmentation; soften lines and wrinkles; and clear acne conditions. The Vi Peel can also be used to treat sun damage on the décolletage and hands. This virtually painless treatment takes only about 15 minutes and requires minimal healing time. Minimal down time, flaking and peeling on day 3-4 & by day 7 you should be amazed! Time invested: Approximately 15 minutes treatment time (up to 30 minutes with paperwork, check in & out). Rebooking: recommended every other week or once a month, as your schedule and budget allows. Series of 4 peels given once every 2-4 weeks. Monthly maintenance, with a lighter peel is preferred to maintain result. Helps provide vibrant, radiant looking skin with minimal downtime. See noticeable improvement after just one peel and compelling results after three to six peels. Appropriate for mild skin imperfections. Who is the ideal candidate for an Illuminize Peel?Illuminize Peel, the gentlest SkinMedica Peel is appropriate for first-time, chemical-peel patients, patients with mild skin imperfections or patients that are looking for brighter, more radiant skin with no downtime. How can I protect my skin post peel?Since new skin is more susceptible to sunburn, extra precautions should be taken to limit sun exposure for at least one week after the peel. Using a broad spectrum sunscreen product with an SPF 30 or higher is recommended. How long should I wait between Illuminize Peel treatments? -For maximum results, the Illuminize Peel can be received every two weeks until desired results are achieved. Results are cumulative and optimal benefits are seen with a series of three or more peels. Key Benefits of Rejuvenize Peel - Smooth the appearance of fine lines, wrinkles and roughness. Who is the ideal candidate for an Rejuvenize Peel? Rejuvenize Peel is appropriate for patients with moderate to severe skin imperfections that result from skin aging and sun exposure, such as fine lines and wrinkles, uneven skin tone and texture. Rejuvenize Peel also address skin unevenness that can be caused by acne scarring or pigmentary changes. After the Rejuvenize Peel treatment, when can I resume my regular skin care regimen? You can resume the use of your regular treatment products after you have completely finished peeling. How often can Rejuvenize Peel be repeated? Rejuvenize Peel can be repeated every 4-6 weeks. Key Benefits of Vitalize Peel - Smooth the appearance of fine lines, wrinkles and roughness. Who is the ideal candidate for a Vitalize Peel?Vitalize Peel is appropriate for patients with mild-to-moderate skin imperfections that result from skin aging and sun exposure, such as fine lines and wrinkles, uneven skin tone and texture. 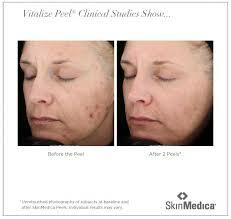 Vitalize Peel treatments also address skin unevenness that can be caused by acne scarring or other pigmentary changes. After the Vitalize Peel®treatment, when can I resume my regular skin care regimen?You can resume the use of your regular treatment products after you have completely finished peeling. How often can I have the Vitalize Peel treatments? Vitalize Peel treatments can be repeated every 3-4 weeks. Any procedures and products that may increase skin sensitivity should be avoided before your treatment. What should I expect during the Vitalize Peel procedure? The complete treatment is expected to take 15-30 minutes, which includes ample time to address any questions you may have, and a discussion on your post peel care. The actual application procedure is approximately 10-15 minutes. Tolerance to the procedure varies from patient to patient. Tingling or burning sensations are normal and expected reactions. A handheld fan can be used during the procedure to minimize discomfort, which usually subsides in a few minutes. How will my skin look right after the Peel? It can leave a yellowish tinge on the skin which is expected to last no longer than 2-3 hours. Mild to moderate redness is expected after any type of chemical peel procedure. The extent of redness varies from patient to patient. The face may appear redder than usual for some time after the treatment and completely resolves after the peeling is complete. Can pregnant or lactating women receive a Peels? • Newest advance in non-laser skin resurfacing! • Only procedure that combines cleansing, exfoliation, extraction, hydration and antioxidant protection all at once! • Equivalent to 5 medical facials & Customized for each client's skin type and condition. Smoothed, Plumped, Hydrated, Refreshed and Younger Looking! HydraFacial MD - A non-invasive medical based skincare level - wet microdermabrasion and chemical exfoliation treatment followed by a targeted vitamin serum infusion for deep and lasting super hydration & combating free radical damage. Tackle superficial imperfections, light pigmentation, fine lines, minor breakout, address texture and deep pore cleansing. No down time, lingering flaking or peeling, only a pink rosy glow with remain. *This is not a facial & is a medical based skincare treatment! Time invested: Approximately 15 minute treatment time (up to 45 minutes with paperwork, check in & out). Rebooking: Initial Series of 6-8 treatments are given on average once a week, then maintenance is recommended a minimum of once a month, as your schedule and budget allows. This Microdermabrasion / peel is excellent at exfoliating tired skin to reveal a glowing completion. After an initial cleansing, we gently polish & peel away excess buildup to address fine lines and sun damage. Finally, your skin will be soothed and hydrated with the highest quality skin care products that leave pores clean and clear, your skin glowing without feeling heavy. No down time, lingering flaking or peeling, only a pink rosy glow with remain. This gentle treatment exfoliates tired skin to reveal a glowing completion. After an initial cleansing, we gently dermaplane away excess buildup of skin cells and vellus hairs. Finally, your skin will be soothed and hydrated with the highest quality skin care products that leaves your skin glowing without feeling heavy. No down time, lingering flaking or peeling, only a pink rosy glow with remain. THIS IS A VERY GENTLE EXFOLIATION. This gentle enzyme peel hydrates while exfoliating tired skin to reveal a glowing completion. After an initial cleansing, we gently peel away excess buildup and hydrate skin. Finally, your skin will be soothed and hydrated with the highest quality skin care products that leave pores clean and clear, your skin glowing without feeling heavy. No down time, lingering flaking or peeling, only a pink rosy glow with remain. THIS IS A VERY GENTLE EXFOLIATION. This peel hydrates while exfoliating tired skin to reveal a glowing completion. After an initial cleansing, we gently peel away excess buildup and hydrate skin. Finally, your skin will be soothed and hydrated with the highest quality skin care products that leave pores clean and clear, your skin glowing without feeling heavy. No down time, lingering flaking or peeling, only a pink rosy glow with remain. This peel is excellent at exfoliating tired skin to reveal a glowing completion. After an initial cleansing, we gently peel away excess buildup to address fine lines and sun damage. Finally, your skin will be soothed and hydrated with the highest quality skin care products that leave pores clean and clear, your skin glowing without feeling heavy. No down time, lingering flaking or peeling, only a pink rosy glow with remain. This peel is excellent at exfoliating tired skin to reveal a glowing completion. After an initial cleansing, we gently peel away excess buildup to address issues associated with acne, clogged pores and inflammation. Finally, your skin will be soothed and hydrated with the highest quality skin care products that leave pores clean and clear, your skin glowing without feeling heavy. No down time, lingering flaking or peeling, only a pink rosy glow with remain. This peel is excellent at exfoliating tired skin to reveal a glowing completion. After an initial cleansing, we gently polish away excess buildup to address fine lines and sun damage. Finally, your skin will be soothed and hydrated with the highest quality skin care products that leave pores clean and clear, your skin glowing without feeling heavy. No down time, lingering flaking or peeling, only a pink rosy glow with remain. We are limited in space due to popularity of IAME MEDSPA. Please arrive with a clean face (no makeup), no high collars please, and please take your necklace and earrings off prior to arrival. •Checks will be accepted on Skinwellness Membership Treatments. 48 hours notice required or full service charge will be charged to your account. THERE ARE A LIMITED # OF APPOINTMENT SLOTS PER INTAKE BLOCK. PLEASE INDICATE IN THE NOTES SECTION IF YOU ARE OPEN TO BOOKING THE NEXT AVAILABLE INTAKE SLOT. I AFFIRM: I am NOT PREGNANT and I DO NOT have any contraindications to ANY skin treatmetns or products. NOTE - YOU WILL RECEIVE A REPLY VIA TEXT MESSAGE AND EMAIL. This is from a staff member not an auto responder. Centrally located to: Interstate 95, 64 & 295.